Central Jersey is the central region of the U.S. state of New Jersey. The designation of central New Jersey with a distinct toponym is a colloquial one rather than an administrative one, with no official definition and even a contentious taxonomic existence. There are varying descriptions as to what composes Central Jersey. North Jersey and South Jersey have been used to describe the northern and southern halves of New Jersey, in the United States. While there is agreement that their border is somewhere in the middle third of the state, there is no official delineation. The region lies roughly at the geographic heart of the Northeast Megalopolis. All descriptions of Central Jersey include Middlesex County, the center of population of New Jersey, and tend to include the region radiating from New Brunswick in Middlesex County and comprising much of Monmouth, Mercer, and Somerset counties. The inclusion of adjacent areas of Hunterdon, Union, and Ocean counties is subjective and a source of debate. The intersection of the two busiest highways in New Jersey, namely the New Jersey Turnpike and the Garden State Parkway, is located in Woodbridge, Middlesex County. Trenton, the seat of Mercer County, is the state capital of New Jersey. New Jersey's geographic center is located in Hamilton Township, Mercer County. In 2011, the population center of the state was alongside Nenninger Lane in the western portion of East Brunswick Township, which is also known as the "Heart of Middlesex County". There are other related, overlapping areas that include counties in the midsection of the state. While the region is considered part of the larger New York metropolitan area in its greatest extent, Mercer County constitutes a separate Metropolitan Statistical Area. The Metropolitan Statistical Areas of New Jersey further subdivides the middle third of the state into smaller groups of counties. Many people residing closer to the northern and southern edges of New Jersey do not recognize Central Jersey and simply distinguish North and South Jersey. The Delaware Valley is another area that includes some parts of Central Jersey. Mercer County is included in the Philadelphia-Reading-Camden Combined Statistical Area, as defined by the United States Census Bureau. Some parts of Hunterdon County associate themselves with the Delaware Valley and the Philadelphia Area, although Hunterdon County isn't geographically defined in this area. The New Jersey Department of Tourism places Middlesex and Union in the Gateway Region and Mercer in the Delaware Valley. Monmouth and Ocean counties are considered part of the Jersey Shore, while Somerset and Hunterdon counties are part of Skylands Region. The Raritan Valley is the region along the middle reaches of the Raritan River and its North Branch and South Branch. The Raritan Valley includes the communities of Branchburg, Bridgewater, Somerville, Raritan, Hillsborough, Franklin, Green Brook, North Plainfield, Bound Brook, and South Bound Brook, all in Somerset County; Piscataway, South Plainfield, New Brunswick, Highland Park, Edison, Middlesex, Dunellen, and Metuchen, all in the northern and central portions of Middlesex County; and Plainfield in southwestern Union County. The Raritan Bayshore is used to describe the region in Monmouth County along the coastline of the Raritan Bay from South Amboy to Sandy Hook. Kingston is the only tri-county community in New Jersey. The telephone area codes 732 and 848 includes Middlesex, Somerset, and Union, Monmouth, and northern Ocean counties. At least two counties in Central Jersey carry official nicknames: Mercer County is known as "The Capital County" and Middlesex County carries the nickname, "The Greatest County in the Land". The original provinces of West and East New Jersey as extant between 1674 and 1702 are shown in yellow and green, respectively. The Keith Line is shown in red, while the Coxe and Barclay line is shown in orange. Between 1674 and 1702, in the early part of New Jersey's colonial period, the border between West Jersey and East Jersey ran diagonally across the middle part of the state. The Keith Line, as the demarcation is known, ran through the center of what is now Mercer County. This border remained important in determining ownership and political boundaries until 1745. Remnants of that division are seen today, notably as the Hunterdon-Somerset, Ocean-Burlington, and Monmouth-Burlington county lines. The division of the two provinces was cultural as well as geographical. New Jersey's position between the major cities of New York and Philadelphia led Benjamin Franklin to call the state "a barrel tapped at both ends". Travel between the two cities originally included a ferry crossing. Due to the obstacles created by the Meadowlands and the Hudson Palisades, passengers from New York would cross the North River (Hudson River) and the Upper New York Bay by boat and then transfer to stagecoaches to travel overland through what is now Central Jersey. One route from Elizabethtown to Lambertville was known as Old York Road. Another route, from Perth Amboy through Kingston to Burlington, ran along a portion of the Kings Highway, These roads followed Lenape paths known respectively as the Naritcong Trail and the Assunpink Trail. Raritan Landing, across from New Brunswick in today's Piscataway, became was important inland port and commercial hub for the region. Two of the nine Colonial Colleges, founded before the American Revolution, were the College of New Jersey (now Princeton University), and Queens College, (now Rutgers University). All of the region's counties are ranked among the highest income counties in the United States, as measured by median household income. It has been called the state's "wealth belt". For decades, Central Jersey was a hub for manufacturing in the eastern United States. Many industrial companies had major production facilities in and around the area, including Edison Assembly, Ford Motor Company's production plant for Rangers, Mustangs, Pintos, Mercurys, and Lincolns. Other notable companies include General Motors in Linden, Frigidaire's air-conditioner plant in Edison, Hess Corporation in Woodbridge, Siemens in Edison, and ExxonMobil Chemical. Starting in the 2000s, manufacturing began to leave Central Jersey, and many facilities had closed and moved overseas. The Bell Labs Holmdel Complex has been the site of many innovations in telecommunications and is experiencing a renaissance as a business incubator for high-tech startup companies. Today Verizon Wireless, AT&T Communications, Vonage, Avaya, and Bell Labs are located in the region. 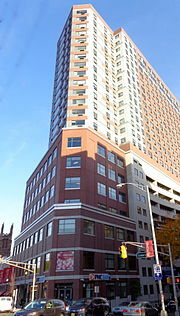 New Brunswick is known as "the Healthcare City", due to the concentration of medical facilities in Central Jersey, including Robert Wood Johnson University Hospital and Saint Peter's University Hospital, as well as the University of Medicine and Dentistry of New Jersey (UMDNJ)-Robert Wood Johnson Medical School. University Medical Center of Princeton is located in Plainsboro. The campuses of the major pharmaceutical corporations Bristol-Myers Squibb Company, Johnson and Johnson, Merck and Sanofi-Aventis are located in the region, as are major operations of Dr. Reddy's Laboratories and Aurobindo Pharma. Princeton University's Frist Campus Center[a] is used for the aerial views of Princeton‑Plainsboro Teaching Hospital seen in the television series House. Major shopping centers include the Freehold Raceway Mall, Woodbridge Center, Menlo Park Mall, Bridgewater Commons, Monmouth Mall, Brunswick Square Mall, Quaker Bridge Mall, Princeton Market Fair, Ocean County Mall and Jersey Shore Premium Outlets. Rutgers-New Brunswick, Monmouth University, Princeton University, Rider University, New Brunswick Theological Seminary, and The College of New Jersey are located in Central Jersey. Each county maintains its own county college, with the exception of Hunterdon County - whose residents may attend either Raritan Valley Community College (located in Somerset County) or Mercer County Community College (located in Mercer County) at no additional cost or Monmouth County - whose residents also have the choice of attending Brookdale Community College which was recently listed as one of the top three community colleges in the state. Thomas Edison State College in Trenton provides extensive on line and adult education. Kean University is in Union County. Popular tourist attractions in Central New Jersey include Six Flags Great Adventure, Gateway National Recreation Area, Monmouth Park Racetrack, Freehold Raceway, and the many boardwalks along the northern Jersey Shore, in Monmouth County and northern Ocean County. The New Brunswick music scene has produced many successful indie bands. The city also is home to the New Jersey Folk Festival. In an early era, the Stone Pony and Asbury Park Convention Hall were important venues on the rock scene. Major music and theater venues in the region include PNC Bank Arts Center, the Trenton War Memorial, the McCarter Theater, the Count Basie Theater, the George Street Playhouse and the Starland Ballroom. East Jersey Olde Towne Village, the Road Up Raritan Historic District as well as those in Trenton, Lawrence, and Princeton recall the colonial era. Ocean Grove is one of the largest national historic sites in the United States. Depending on the location, different parts of Central Jersey fall into overlapping spheres of influence from New York media market and Philadelphia media market. Mercer, Monmouth, Ocean, and Middlesex Counties are part of both the New York City and the Philadelphia television markets, while the rest of the region is part of the New York market. While the Star-Ledger has the largest circulation of all newspapers in New Jersey, four regional newspapers - Asbury Park Press, Home News Tribune and two Trenton dailies, The Trentonian, and The Times- and several local papers are published in Central Jersey. New Jersey On-Line, CentralJersey.com and MyCentralJersey.com are web based news services. During statewide political events like Gubernatorial or Senatorial election debates often held in Trenton, partner stations from both the New York and Philadelphia markets pool resources together to co-host the events and bring them to New Jersey homes. Identification with sports teams is also affected by the region's location, and it is not uncommon to find fans of major sports teams of either city. For example, while residents of northern New Jersey root for New York teams, those in the southern part of the state root for Philadelphia teams. The distinction is less clear in Central Jersey. Central Jersey Riptide was a short-lived professional soccer club. Interstate 195 is called the Central Jersey Expressway. The New Jersey Department of Transportation (NJDOT) operates three divisions in the state: North, South, and Central, which encompasses Hunterdon, Mercer, Middlesex, Monmouth, Ocean, and Somerset counties and portions of Warren County. (Routes 22, 122, 173, 78 and including south of Route 57). Apart from Mercer County, which comes under the auspices of the Delaware Valley Regional Planning Commission, all counties in the region are part of the North Jersey Transportation Planning Authority, a government partner which approves transportation projects for the state. The United New Jersey Railroad and Canal Company traversed the region in 1830, eventually becoming the Pennsylvania Railroad (PRR). NJT's Northeast Corridor Line and the North Jersey Coast were once part of the PRR, as was Amtrak which serves the commuter hub at Metropark, New Brunswick, and the Trenton Transit Center. The Central Railroad of New Jersey once connected Jersey City (with connecting ferries to Manhattan) and many Central Jersey towns. Much of that system is now included in New Jersey Transit rail operations to the Raritan Valley. New Brunswick is known as the Hub City, and at one time was a regional transportation hub for streetcars which converged in the city. The Monmouth Ocean Middlesex Line has been proposed for the region. The Garden State Parkway, New Jersey Turnpike (Interstate 95), Interstate 287, U.S. Route 1, U.S. Route 9, New Jersey Route 18, and New Jersey Route 35 are major automobile routes through Central Jersey that pass over the Raritan River at Perth Amboy and New Brunswick. Interstate 195 travels through Central Jersey (hence the name "Central Jersey Expressway") from the Trenton area towards Belmar. From the Raritan Bayshore, SeaStreak catamarans travel to Pier 11 at Wall Street and East 34th Street Ferry Landing. NY Waterway ferries travel to Paulus Hook Ferry Terminal in Jersey City, Battery Park City Ferry Terminal, and West Midtown Ferry Terminal. As of 2018, there are plans to create ferry service from Carteret in Middlesex County. Trenton-Mercer Airport is the only airport in Central New Jersey providing long-distance commercial service. Monmouth Executive Airport, formerly known as Allaire Airport, is a public-use airport located near Allaire State Park. Central Jersey Regional Airport is a privately owned, public airport in Somerset County. Linden Airport is a small general aviation airport located along U.S. Route 1&9 in Union County. The Route 9 BBS, the New Brunswick BRT, and the Central Jersey Route 1 Corridor are projects in the region intended to expand the use of bus rapid transit in New Jersey. Swaminarayan Akshardham (Devnagari: स्वामिनारायण अक्षरधाम) in Robbinsville, Mercer County, inaugurated in 2014 as the world's largest Hindu temple. Central New Jersey, particularly Edison and surrounding Middlesex County, is prominently known for its significant concentration of Asian Indians; the growing Little India neighborhoods running along Oak Tree Road in Edison and neighboring Woodbridge Township encompass several hundred Indian-run businesses. The world's largest Hindu temple was inaugurated in Robbinsville in 2014, a BAPS temple. Carteret's Punjabi Sikh community, variously estimated at upwards of 3,000, is the largest concentration of Sikhs in the state. In Middlesex County, election ballots are printed in English, Spanish, Gujarati, Hindi, and Punjabi. Edison is also home to a growing Chinatown and Koreatown, running along New Jersey Route 27. ^ "Annual Estimates of the Resident Population: April 1, 2010 to July 1, 2014 - 2014 Population Estimates". United States Census Bureau. Retrieved March 27, 2015. ^ Stirling, Steven (April 17, 2015). "Help us figure out the boundaries of North, Central and South Jersey once and for all (INTERACTIVE MAP)". NJ Advance Media. Retrieved June 2, 2015. ^ Stirling, Steven (April 24, 2015). "Here are the North, Central and South Jersey borders as determined by you (INTERACTIVE)". NJ Advance Media. Retrieved June 2, 2015. ^ Peter Genovese (November 14, 2016). "11 reasons why Central Jersey is better than North or South Jersey (slide 4)". New Jersey On-Line LLC. Retrieved November 16, 2016. ^ "Visitor Information - Regional Tourism". Archived from the original on February 3, 2011. ^ "Optimum Online Television Service. Channel lineup for the Raritan Valley region, consisting of, "Bridgewater, Edison, North Brunswick, Old Bridge, Piscataway"". Optimum.com. Retrieved October 15, 2017. ^ "Raritan Valley Line operated by NJ Transit. Covers Hunterdon, Somerset, Middlesex and Union counties" (PDF). NJTransit.com. Retrieved October 15, 2017. ^ "Raritan Valley Community College". raritanval.edu. ^ "Raritan Valley Rowing Camp. A program sponsored by Rutgers University in New Brunswick". ScarletKnights.com. Retrieved October 15, 2017. ^ "Raritan Valley Conference". raritanvalleyconference.com. ^ Bowes, Karen E. (August 30, 2006). "Blueprint complete for improved Rt. 36: County to vote on Bayshore Regional Strategic Plan". Holmdel Independent. Archived from the original on January 25, 2013. Retrieved February 10, 2012. ^ Muser, Jeanette K. "Kingston: Crossroads To History". Kingstongreenways. Retrieved July 17, 2008. Although the community remains unincorporated today, residents share a common heritage that goes back to the 17th century. What makes Kingston so unique, however, is that it is the only tri-county community in New Jersey. ^ "Mercer County "The Capital County"". County of Mercer, New Jersey. Retrieved October 27, 2016. ^ "Middlesex County The Greatest County in the Land". County of Middlesex, New Jersey. Retrieved October 27, 2016. ^ "Historic Preservation in Princeton Township. A Brief History of Princeton". Office of Historic Preservation. Princeton Township. Retrieved February 15, 2012. ^ "Where was the West Jersey/East Jersey line?". westjersey.org. ^ "How a man named Keith took a long walk and defined N.J. forever". NJ.com. June 2015. Retrieved October 15, 2017. ^ Fairall, Herbert (1885). The World's Industrial and Cotton Centennial Exposition, New Orleans, 1884-1885. p. 225. Google Book Search. Retrieved on December 4, 2009. "Dr. Benjamin Franklin once perpetrated the witticism 'that New Jersey was like a beer barrel tapped at both ends, with all the live beer running into Philadelphia and New York.'" ^ Soderlund, Jean R. (October 15, 1996). Wacker, Peter O.; Clemens, Paul G. E. (eds.). ""A Barrel Tapped at Both Ends": New Jersey and Economic Development". Reviews in American History. 24 (4): 574–578. JSTOR 30030707. ^ "Recovering Raritan Landing The Archeology of a Forgotten Town". New Jersey Department of Transportation. 2002. Retrieved July 5, 2011. ^ Garbarine, Rachelle (September 26, 1999). "In the Region /New Jersey; 'Living Large' in the State's New 'Wealth Belt'". The New York Times. ^ "'Wealth-belt' of state shows big population gains". USA Today. March 9, 2001. ^ Attrino, Anthony (October 5, 2012). "Edison's ExxonMobil to close Middlesex County plant in 2014". NJ.com. ^ Fisher, Janon (February 27, 2004). "With Last 50 Pickups, Ford Ends 56 Years of Work in Edison". The New York Times. ^ Siwolop, Sana (January 26, 2005). "Edison Hopes to Transform Old Factory Sites, Smartly". The New York Times. ^ Coyne, Kevin (December 5, 2008). "Fear in the Land of Vanished Auto Plants". The New York Times. ^ Shawn Marsh (August 7, 2016). "Former N.J. Bell Labs site seeks to inspire new inventors". North Jersey Media Group. Retrieved August 22, 2016. ^ 7:30 a.m. -- Filling cracks in the HealthCare City, from the Home News Tribune, September 23, 1999. "With two major hospitals and a medical school, New Brunswick proclaims itself The Healthcare City." ^ A wet day in the Hub City, Home News Tribune, September 23, 1999. "A few days short of 60 years, on Wednesday, Sept. 16, a dreary, drizzly day just ahead of the deluge of Hurricane Floyd, the Home News Tribune sent 24 reporters, 9 photographers and one artist into the Hub City, as it is known, to take a peek into life in New Brunswick as it is in 1999." ^ Holtz, Andrew (2006). The Medical Science of House, M.D. Oncology Times. 28. Berkley Trade. pp. 50–52. doi:10.1097/01.COT.0000295295.97642.ae. ISBN 978-0-425-21230-1. Retrieved June 19, 2009. ^ Cohen, Micah (July 14, 2012). "In Blue New Jersey, Red Spots May Be Sign of the Past". New York Times. Retrieved November 24, 2013. ^ "Here are the results of the N.J. NHL fan border battle (INTERACTIVE)". NJ.com. June 2015. Retrieved October 15, 2017. ^ "Which baseball team are you supporting in our N.J. border battle?". NJ.com. April 2016. Retrieved October 15, 2017. ^ "Directory". New Jersey Department of Transportation. Retrieved December 31, 2015. ^ "The Trolleys and Trains That Made New Brunswick the Hub City". NewBrunswickToday.com. Retrieved October 15, 2017. ^ 5 things to know about Central Jersey's proposed fast ferry to N.Y.
^ Frances Kai-Hwa Wang. "World's Largest Hindu Temple Being Built in New Jersey". NBC News. Retrieved December 15, 2016. ^ Joseph Berger. "A Place Where Indians, Now New Jerseyans, Thrive". The New York Times. Retrieved August 22, 2016. ^ "State of New Jersey Department of State". State of New Jersey. Retrieved May 29, 2017. Sullivan, S.P. (May 30, 2014). "Jersey's Mason-Dixon line: Mapping the Taylor Ham vs. pork roll divide". NJ.com. Strauss, Robert (July 13, 2008). "North Jersey or South? A Search for the Line". The New York Times.